I’m Trish Preston of Two Peas in a Pod and I’m excited to be here on WeAllSew today to share with you a tip for special handmade gifts. I just released my first book several months ago, Because I Love You Sew, and it’s all about sewing for others and making special memories. We have a little surprise, too, at the end of the post! One thing I love to add to my handmade gifts is some sort of personalization and some unique textured elements. It just adds that something special to the gift. When my nephew got married last summer, he was the first boy in the family to get married. The start of a new family. Which led me to think about all those wonderful love stories in our family that came before his. 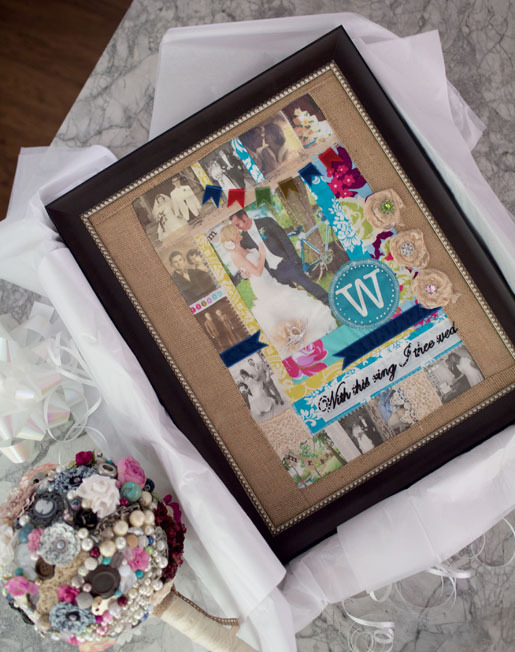 That’s what inspired one of the projects in the book – the Wedding Memories Collage. I used speciality stitches on my BERNINA 580 sewing machine to sew on pieces of velvet and lace and create layers of texture. I also used the script feature to inscribe a message on the back of the collage along with the date. There are so many decorative stitches that I had fun just playing with them all and using a wide variety in this project to “quilt” the collage. All of those unique stitches and layers of texture really made this project into something that felt full of life. I encourage you to think about how you can add special layers of texture and quilt them using decorative stitches and inscribe a special message onto your gift. I’m making a lot of zippy pouches for my daughters and their friends this holiday season. I’m using the script feature to write messages in the lining that say “you are loved” and “you are beautiful”. I love that added feature. 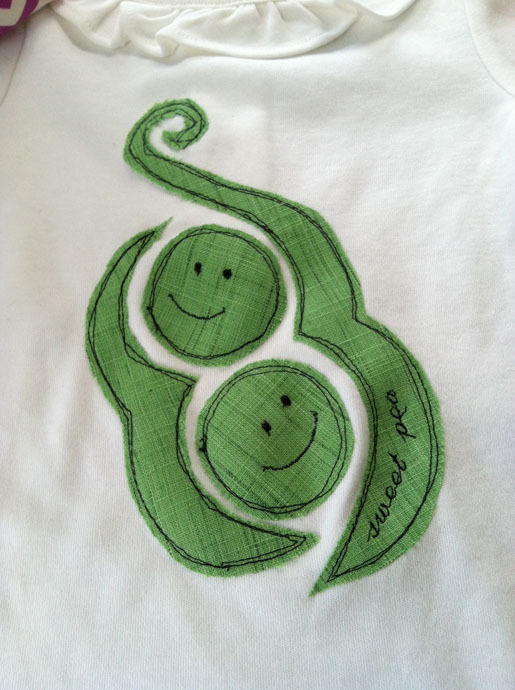 And on a recent baby gift I made, I used that script feature again to write “sweet pea” on the onesie I appliquéd. I hope you take the time this holiday and all year, to make special gifts for someone you love and make them extra special with added personalized touches. 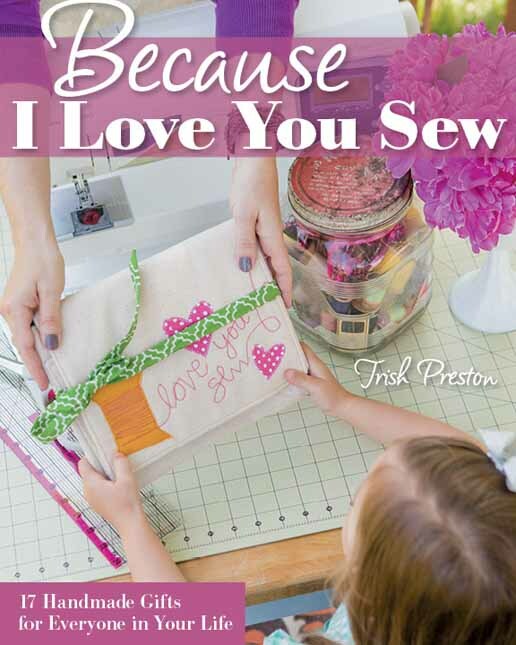 One lucky reader will win a copy of Trish’s book, Because I Love You Sew! To enter, leave a comment below about a handmade gift you made for someone special. We’ll draw a winner Sunday night, December 14, 11:59:59 p.m. Central Time. Sweepstakes Rules: Open to residents of the 50 United States and the District of Columbia. One comment per fan. Comment must be submitted to the WeAllSew.com blog by Sunday night, December 14, 11:59:59 p.m. Central Time. Winner will be chosen randomly. Winner will be notified by email and will have 48 hours to contact us at WeAllSew@berninausa.com to claim the prize; winner will be announced on WeAllSew about one week after contest ends. my daughters love to carry around pillowcases filled with stuffed animals so for Christmas this year, i made them each several fun , brightly colored pillowcases just for their stuffed animals and also to use as “Santa sacks”. So when they wake up Christmas morning, these pillowcases will be filled with their gifts from Santa . I can not wait for the girls to start using these pillowcases. Made each grand-daughter a rag quilt with matching pillowcase. They picked materials and we personalized. Last Christmas I made my parents a quilt from t-shirts that my brothers and I had collected from our adventures in the Navy. Sewing for family and friends is my favorite thing. I currently do not own one quilt that I have made. All have been given away to family, friends or charity. Not a comment really but would like to know why your Canadian customers are not allowed in your contest? We spend more money on our hobbies than oour American friends because of the exchange so come on give us a break,eh?? This year i am making ornaments. Previous years i have made placemats with matching napkins. Sew much to sew, so little time, lol.